Two outstanding examples of socialist-themed plays are combined in this remarkable volume. The Conspiracy of Feelings by Yurii Olesha (1899-1960) is based on his highly respected short novel Envy about the struggle between the old and new in Soviet society. The play, called The Conspiracy of Feelings, is not a simple adaptation, but an original work that reconceived the novel. The play explores the precarious position of the intelligentsia in the new collective state. The Little Theatre of The Green Goose was written by Konstanty Ildefons Galczynski (1905-53) who was one of Poland's most beloved poets. After World War II, he began work as a playwright, inventing a colorful theatre troupe of performers (animal and human) and contributing a new instalment of The Little Theatre of the Green Goose each week to Przekroj, the Cracow literary magazine. 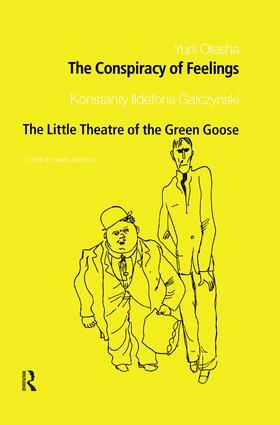 Intended for reading only, The Green Goose went unperformed in Galczynski's life and was finally staged in 1955 and gained a permanent place in the theatre and became a force for the creation of the new Polish drama that flourished in the 1960s.